TheaterWorks Hartford, under the guiding hand of producing artistic director extraordinaire Rob Ruggiero, has done it again with yet another execution of intelligent, powerful, stimulating theatre. Productions that on the one hand, stray somewhat from typical, mainstream offerings; but on the other, works that are so damn good, they should be placed squarely at the top of everyone’s list of stage must-sees. Plays that are stripped down to the rawest, most essential elements – those which Aristotle told us over 2,000 years ago must include: a dynamic plot/storyline; an evocative theme; rich, colorful characters; eloquent, moving dialogue; an essential rhythm and chemistry; and a rewarding spectacle (all of its visual elements, i.e. set, costumes). 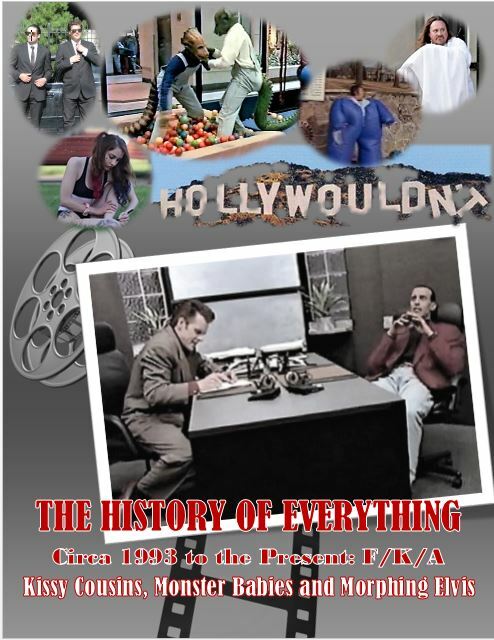 Add in modern theater’s contributions, and you also get a masterful convention (writing and directorial style); a genre which is reflective of topics important in our times; and an entire experience which TheaterWorks considers worthy of its shrewd, eager audience. What they’ve done this time – and ever so flawlessly – is deliver to us playwright Dominique Morisseau’s seductively compelling drama Sunset Baby. Morisseau created a searing, character-driven work that simultaneously both sharply and sensitively shows the pain and conflict of worlds colliding – political, social, and personal. 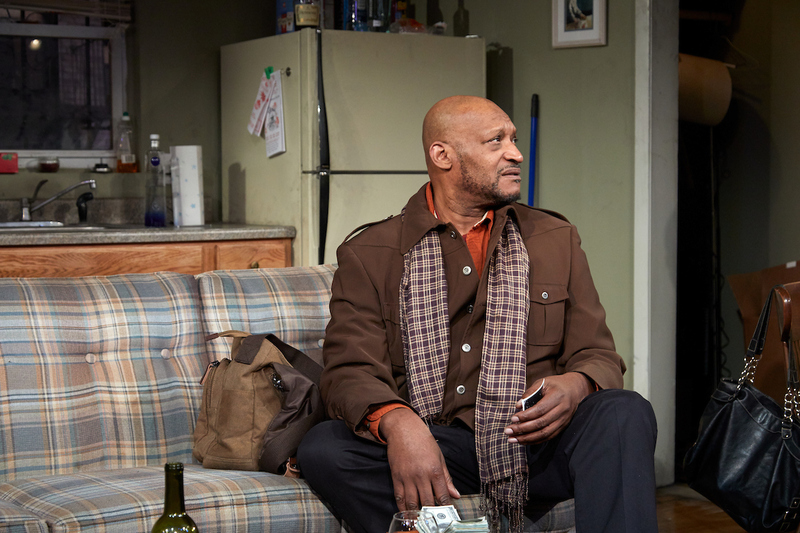 Expertly directed by Reginald L. Douglas (this is his highly successful debut at TheaterWorks), the audience is able to suspend time and place and enter the lives of three complex and tormented characters. Family – we all have one, and frankly some are more dysfunctional than others. When Kenyatta, a former revolutionary in the black underground, pays his wayward daughter, Nina, an unannounced visit, she wants no part of the man who abandoned her as a child. She’s bitter, angry, and has just recently lost her crack-addicted mother. And she’s happy to throw in her father’s face the woman she’s become as a result; she and her lover, Damon (love is a term to be used very loosely), are a Bonnie-and-Clyde team of street hustlers and drug dealers who aren’t entirely ashamed to admit they violate their own just to get by. But they have goals that transcend their current condition – goals which may or may not coincide – and they strive for something more. Nina has put up walls – barbed-wire wrapped, and ten-feet tall. She’s made it clear she has no desire to give her father the letters she holds that her mother wrote to him while he was in prison. He actions are as much to punish him as to not have to acknowledge the true meaning of the writings. She can’t open up to anyone, even in the two years she has been with the slick, cocky Damon. We see the crash and clash of past, present, and future. We see the impact of family, dysfunction, and personal wants and priorities. We ponder the many meanings of the term “revolution.” And we see happens when love and the potential for happiness are thwarted for reasons beyond our control or grasp. Douglas sensitively weaves all of the myriad layers into an exceptional tapestry. His cast, an incredible trio of impassioned artists who wholly embody each of their characters. I must tell you that my husband/co-reviewer was jumping out of his skin when he learned the one and only Tony Todd (Night of the Living Dead, Candyman, and TV’s The Flash, to name only a few) was headlining. Todd effortlessly delivers a heady, heartfelt, and commanding portrayal of Kenyatta, a man clearly tortured by life and the consequences of his past choices. Brittany Bellizeare is mesmerizing as the intense, cutting, yet vulnerable Nina. She’s a tangle of Daddy issues, urban life, anger, and personal struggle. 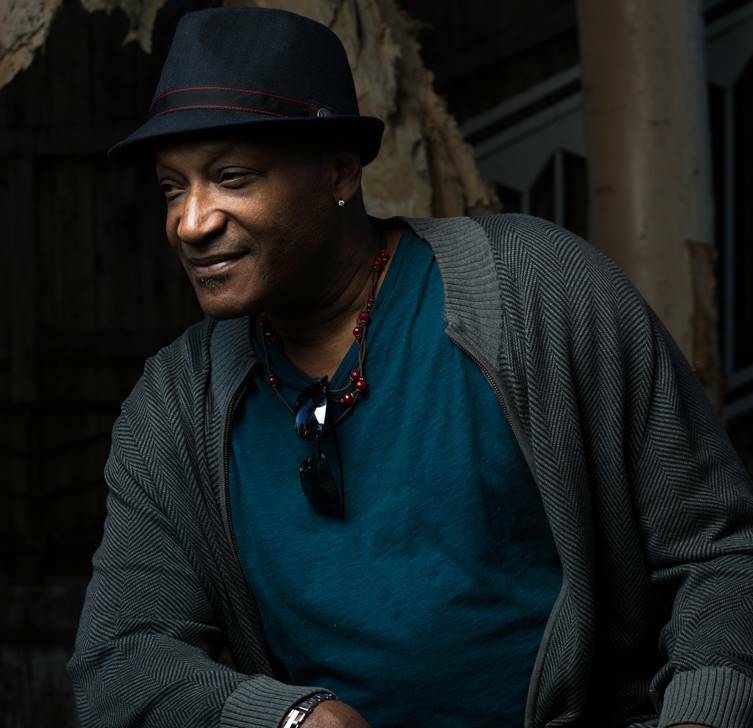 And Carlton Byrd as Damon is smooth as ice – you’re never quite sure if he’s a wolf in sheep’s clothing or a sheep in wolf’s clothing. He’s fiery and street-smart yet unexpectedly cerebral and indeed mad for Nina. As Aristotle said, the spectacle is a truly essential component of successful theatre and kudos must go to Alexander Woodward for an exceptional set design that makes you feel as if you actually are looking into Nina’s sparse, run-down, Brooklyn apartment. Karen Perry’s costume design is spot-on. Shout-outs to Rob Denton for lighting design and Julian Evans for sound design. Final hands also to Laura Stanczyk Casting, Bridget Sullivan as production manager, and Kate J. Cudworth as stage manager. We are not often given the opportunity through enormously authentic theatre to feel as if we may peer into the window of the lives of others – and in this case, others whose lives may be vastly different than our own. But at the same time, it neither is a stretch to be able to appreciate the parallels of both worlds which in so many ways, really are not that much different. Thank you TheaterWorks for this incredibly engaging, sharp, and powerful work and for always thinking outside the box. There’s no excuse for the young people not knowing who the heroes and heroines are or were. TheaterWorks Hartford’s production of Dominique Morisseau’s Sunset Baby is riveting, searing, mesmerizing. In fact, just about any superlative ending in “ing” is applicable – captivating, stimulating, thrilling. Powerful and edgy – even superlatives not ending in “ing” are appropriate. The play is a complex, layered, highly nuanced look at the present generation’s predilection toward the dual yet antithetical components of societal self-destruction and generational reconstruction. 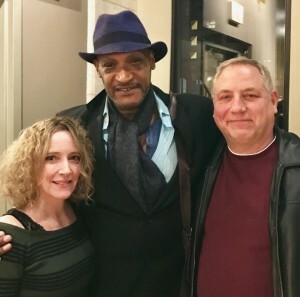 The storyline of Kenyatta Shakur (Tony Todd) a black revolutionary and political prisoner and his desire to reconnect with his long-lost daughter, Nina (Brittany Bellizeare), is deceptively simple on the surface. Nina is a bad girl grifter on the hustle with her bad boy boyfriend (Carlton Byrd), a well-read, savvy survivor from the hood. From the log lines above, one could jump to the conclusion that the play revolves around the life of a broken child with daddy issues – and one would be right – to an extent. Still waters run deep and this would be an oversimplification of the play. Indeed, Sunset Baby goes far beyond this superficial veneer of a father-daughter relationship to the core of the human condition and all of our contradictory, compulsive, and even destructive behaviors. The writing is exhilarating (another superlative ending in “ing”) with rapid-fire, uber-realistic dialogue right out of Urban Dictionary. Symbolism abounds, whether explicit – Nina being named after Nina Simone, jazz great and civil rights activist – or more subtle, like the naming of Nina’s father Kenyatta Shakur, after the late Tupac Shakur, whom Ms. Morisseau acknowledges was a major inspiration for the play. But writing is only one major component of great theatre. 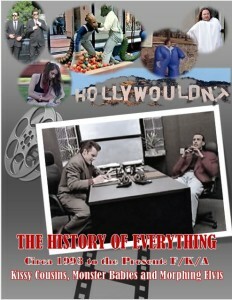 There are many others including a creative director with a master vision and in incredibly talented cast. Sunset Baby boasts both. Director Reginald L. Douglas (who also is the Artistic Producer of City Theatre Company in Pittsburgh) established an unrelenting pace that will keep you on the edge of your seat. And what of the three-character cast? They are simply superb in every way. 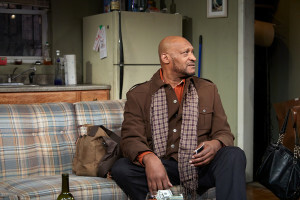 Veteran stage and film actor Tony Todd as Kenyatta Shakur kills it. He is a consummate performer who has complete mastery over his impressive instrument: a six foot-plus, hulking frame and a booming voice which can handle everything from Shakespeare to urban slang. He has a commanding presence which engages your complete attention. (Okay, I think it’s fair to disclose that I am a horror film fan and have loved him in such classics as Night of the Living Dead, The Crow, Candyman, the Final Destination franchise.) Brittany Bellizeare is spot-on as the tough-yet-vulnerable Nina who dreams of a life of middle-class normalcy. And Carlton Byrd is on an actor bender (that’s from Urban Dictionary) as the intelligent-but-street-savvy hustler Damon. Street Speak slides off his tongue as easily as a switchblade through butter. And even though Damon is a hustler, thief, and probably also a murderer, the character remains likeable (maybe even sincere) as a direct result of Mr. Byrd’s layered portrayal and personal charisma. Sunset Baby is an authentic slice of theatrical greatness that must be experienced while the sun is still shining on it. Kudos must go to Artistic Director Rob Ruggiero for allowing us to experience this significant piece of theatre.